This high quality belt in crafted using our Premium quality English Bridle Leather for many years of looking great! Available in many lengths to fit you perfect. This belt is 1 3/8" wide and will fit most belt loops perfectly. 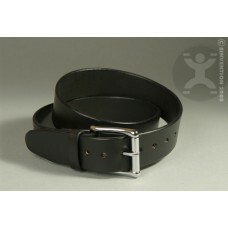 Features a leather keeper loop and very nice quality understated buckle. All edges are rounded and dyed. We make these belts to custom fit you! Please contact us with your size requirements.